So, we finally made it to Ohio around 5:30, after only 3 stops and leaving an hour and a half later than I wanted to. I don't think we did too bad. My husband was relieved to finally be done driving. Now, comes the fun part. Saying hi to people that we haven't seen in about 5-10 years. This is Mrs. Athy aka Ma Athy as I like to call her. I was really good friends with her daughter in high school and so she kind of just became a second Mom to me. She is so nice! She said she has all of my kids' pictures on her fridge! Where do I begin with Janelle... Do I tell you the trouble we would get into or the good stuff? Well, let's just stick to the nice stuff. We graduated together, I attended her 1st baby shower for her son that is now 13! We were in Marching Band together and 4-H. I haven't seen her for 10-12 years! It has been a very long time! It made me realize how good of friends we still are when we could just pick right up where we left off. I love her and I wished our families lived closer! New friends, our husbands, bonding over beers! I don't think we stopped laughing and talking since we saw each other. That's why in every picture we have our mouths open! My friend Steph mentioned that I could have taken my nursing bib off for the picture! And what's up with me and my double chin?? Wow! What's that exercise thing you can buy off the TV? I may have to look into that! Abigail photo bombed the picture! Silly girl!! I think we are saying good-bye and planning to get together soon, maybe halfway in Indianapolis. I don't want 10 years to go by again before we see each other!! The next day, I decided to force my family to go into my home town and do a little sight seeing! They were so thrilled about that! There wasn't much to see mind you, but I still wanted to show my kids where I lived and went to school. So, this was our Ohio house. I used to sell people ice cream cones, malts, shakes, hot fudge sundaes, and banana splits here! 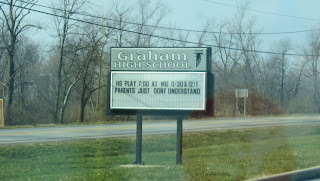 Here is my Alma Mater! 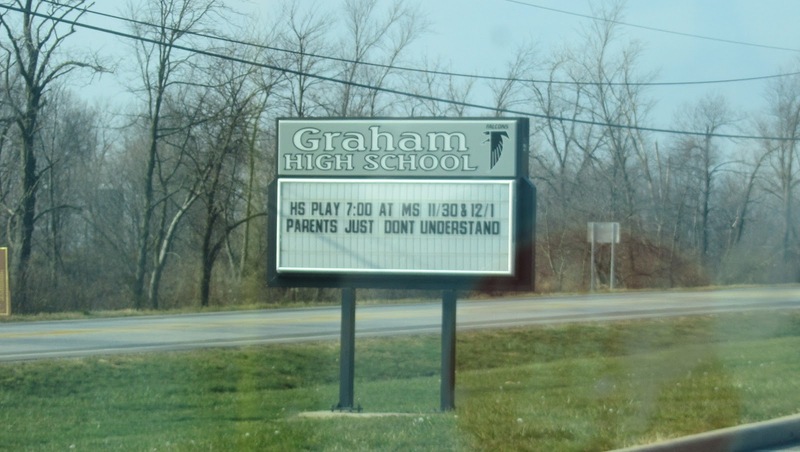 Graham High School - the Graham Falcons!! 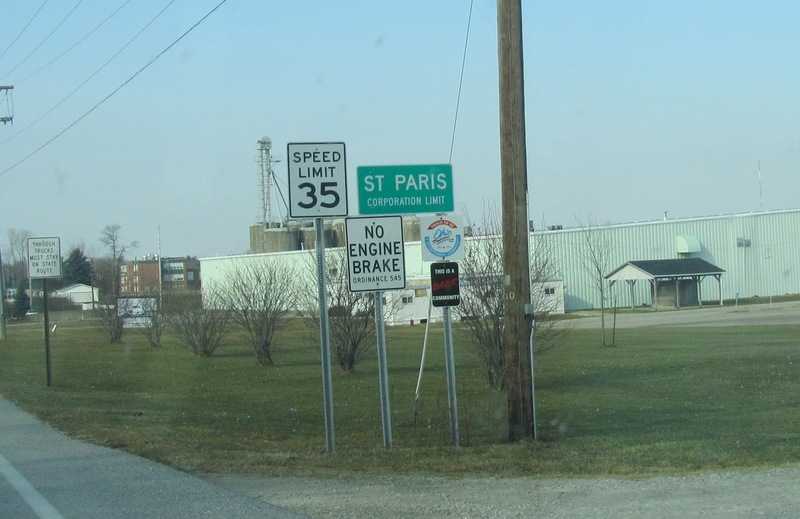 The town sign of St. Paris, population 1500. Last, but not least, I had to include this in our sightseeing trip because this is the 1st drive-thru my husband has been through. He thought it was strange that you didn't get of your car instead you just tell the man what you want. He said he felt like a redneck! So, that was pretty much it on our sightseeing trip! Tomorrow I will share pictures from my friends' beautiful wedding! So come back tomorrow!! I keep cracking up over all of this! You can tell we've both been gone for awhile because I kept nodding and smiling through this whole post! Seeing old friends is just THE best and the fact that this was your husbands first time going through a drive through made me crack up! J didn't know what one was until he me me either! He just thinks its hilarious!!! LOL! GREAT post!